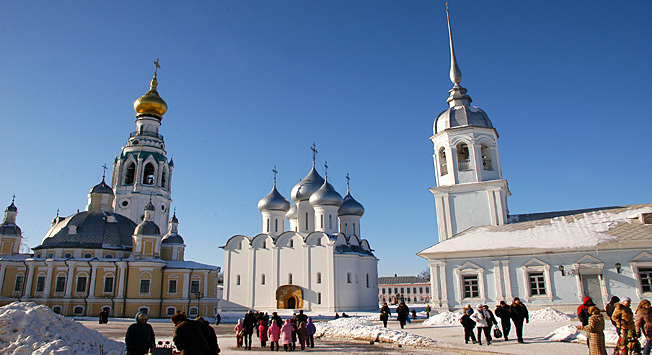 Northwest of Moscow, church-studded Vologda is one of the most underrated travel destinations in Russia. Why travel 460 kilometers from Moscow for winter holidays instead of staying in Russia's capital or going to the snow-covered slopes of Krasnaya Polyana in Sochi? Vologda is part of a new tourist route covering the area around St. Petersburg, aptly called the Silver Necklace. Besides Vologda the route includes 11 other big cities and folk craft centers in northwestern Russia. This route is being presented as an alternative to the popular Golden Ring. It consists of several interconnected smaller routes such as St.Petersburg – Veliky Novgorod – Vologda, which allows tourists the option of being flexible while remaining in charge of their travel plans. A local resident Natalya says that people come to the area to experience the “peaceful life” of the region. In winter Vologda looks very peaceful indeed full of sun, snow, the cozy atmosphere of a winter fairy-tale, the Vologda Kremlin, St. Sophia Cathedral, the lights of New Year's trees, decorated city streets and a quirky monument to the Vologda accent that is a bit unusual for the Moscow ear. V-O-l-O-gda – this is how local residents call their city, and soon you will, too. The festive feeling never stops and is enabled by the multicolored terem (wooden palace) of the Russian Santa Claus, Ded Moroz (Father Frost). His residence has everything to help one feel the atmosphere of New Year's (which is the most important winter holiday in Russia, not Christmas): mittens, valenki (felt boots), a throne room and a snow-covered forest all around. Lace created by Vologda craftswomen was considered an object of luxury up to the 17 th century in Russia. Today it is slowly becoming a disappearing art. Despite the contemporary technologies available today lace patterns are still created by hand following the historically developed artistic tradition of the craft. Not only women, but men, too, can tat lace in the Vologda Region. Russia’s only museum of lace in Vologda found itself on the top-10 list of best museums countrywide in 2015 according to TripAdvisor. It quickly became one of the favorite places in the city for travelers from all over the world. A tourist from Italy says that he went into the museum to hide from the rain, but instead discovered the unusual art of the Russian North. American and French tourists were happy to find out that they could read about exhibits in their native languages. The house where Vologda craftsmen and craftswomen (representing not only lace makers but also other crafts such as linen cloth makers and wood carvers) is called the Reznoi Polisad (Carved Fencing) Center of Folk Crafts. One of Vologda’s gastronomic symbols is butter with a unique nutty taste to it that is achieved due to a special method of warming up the cream. Here it is eaten separately and with freshly baked rye bread. Go to Semenkovo village where you can witness the old process of preparing Vologda butter. It is also eaten with fish, boiled potatoes and dill, and, of course, with pancakes and caviar. Having fun in the wintry open air is very popular in Vologda among locals and tourists. Despite its Northern location, winters here are relatively mild and snowy, which enables people to spend a lot of time outdoors. When the first frost comes the primary attraction of the winter season comes to the fore: a wooden “tsar-slide” 125 meters long and 10 meters high that is believed to be the biggest in Russia. Sliding down such hills made of snow is an old Russian winter activity; other seasonal fun includes fairs, round dances and swinging. But for those who prefer steep uphill climbs and achieving fast downhill speeds, there are mountain tracks and a snow park at the Y.E.S. Center of Active Recreation and Tourism. Their smallest hill is 90 meters up and the mountain ski tracks are more than 4 kilometers long.